Note: I’m skipping some things and/or posting them out of order until I get caught up. 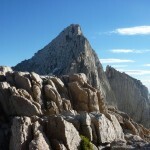 At 13,990, Mount Barnard is almost a California 14er; in fact, since Mount Whitney’s elevation was recently revised from 14,497 to 14,505, Barnard may be only a modest cairn short of 14er-hood. While I had an ulterior motive to visit the area, that alone should be reason enough. 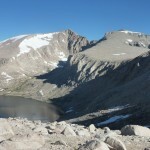 The standard way to climb Barnard and/or Trojan is to ascend George Creek to the broad plateau east of the peaks. 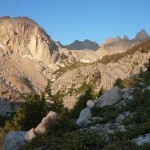 However, (1) George Creek is a famously nasty bushwhack, and (2) I was already at Whitney Portal. From there, the best route is to take Cleaver Col over to Wallace Lake, climb Barnard from there, traverse to Trojan, then return (over Barnard, unfortunately). If you want to take your chances with the rangers, Russell-Carillon Col is higher, but faster on the return. This route seemed logical, and none of the cross-country travel was particularly difficult; only afterward did I realize that it required around 11,000 feet of climbing. No wonder I felt worked. After lying awake watching people’s headlights (and listening to an especially loud and bright Korean party getting ready next to my car), I got a standard 5 AM start. I was surprisingly alone once I left the main trail; I would have expected to meet some climbers, even on a weekday. The creek crossing below the ledges was just as annoying as the last time through, marking the start of a full day of damp feet. 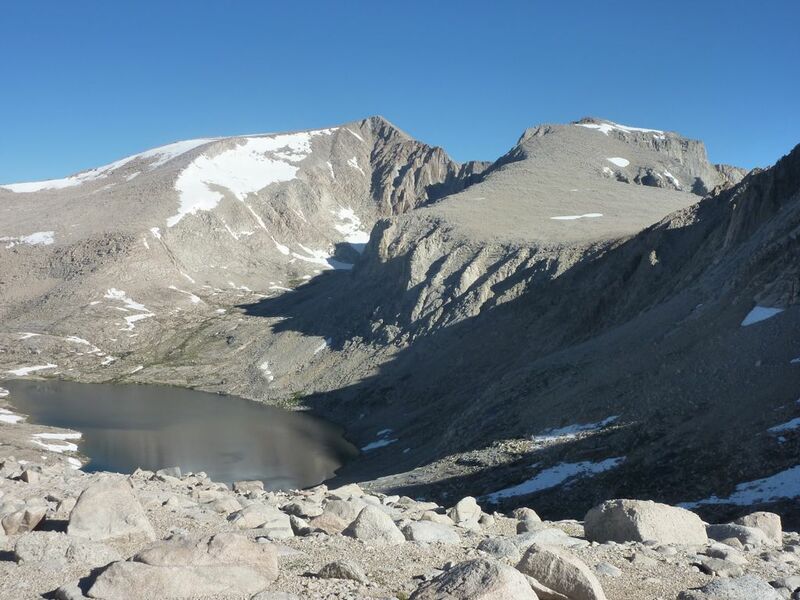 At Lower Boy Scout Lake, I took the increasingly-trodden path up toward Cleaver Col. I’m not sure if it is legal to be there without a dreaded Whitney Zone Pass, but no one seems to care. Other than the final, loose class 2-3 grind, Cleaver Col is one of the Sierra’s more attractive cross-country passes. 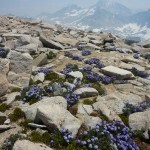 The route meanders up a valley filled with flowers, turf, and easily-climbed granite slabs. It is surrounded on three sides by the spectacular walls of Carillon, the Cleaver, and “Gambler’s Special” (named for a plane wreck). 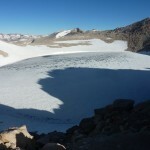 And when you top out, you are suddenly confronted by Tulainyo Lake, a huge, circular thing with no obvious inlet or outlet. The heavy snow made itself felt: careful snow travel was required below the final steep push, and Tulainyo was still mostly snow and ice. Like most snow I have encountered so far, it consisted of medium-sized irregular sun-cups, which are harder to cross than all but the nastiest scree. I made good time to the Col (2h30), then less-good time down to Wallace Lake, which is completely snow-free and home to some giant trout. After topping off my water at the outlet, I began the grind to Barnard. Staying close to the ridge, I was able to mostly avoid the terrible loose sand that plagues this part of the Sierra. Much to my surprise, I ground out the 2400 feet of climbing in just about an hour, despite not feeling very fast. Then things got slow again, as the slope from Barnard to the plateau was covered in large but only semi-stable talus. The plateau itself was a mixture of sand and badly sun-cupped snow. It took a bit over an hour to get to Trojan, and I was starting to feel sluggish. I signed the register (yes, someone had left a Trojan), ate my fish, and took a comfy nap. I woke to see that the smoke had returned in force. I fortunately had more down than up left to cover, but the first part of the return required re-climbing Barnard. In retrospect, I might have been able to save some climbing by traversing to Vacation Pass and dropping from there to Wallace Lake, but I wasn’t in an exploratory mood. The rest of the return went pretty much as expected. From the top of Barnard, the slope right of my ascent route was mostly fast sand skiing. I was surprised, though, that the mosquitoes had woken up near Wallace Lake. They had formed into squadrons that circled near my path, then attacked more ferociously than any I remember from previous Sierra outings, even in the swampy recesses of Big Pine Creek. Thankfully, the wind that brought the smoke also dispersed them a bit. 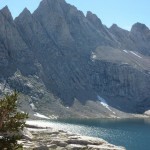 Because Whitney is the highest point in the lower 48, and accessible to anyone in decent shape who can follow a trail, the Whitney area is overused, and has its own special permit. Over the years, the area covered by this permit has expanded, blocking access to many non-Whitney peaks. You can almost always get a permit by waiting around in Lone Pine the afternoon before your trip, but this is a waste of a day. 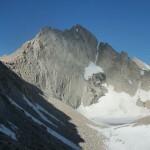 Uncrowded peaks made difficult to climb thanks to the insane quotas include: Russell, Carillon, the Cleaver, Tunnabora, Hale, Young, McAdie, Marsh, Morgensen, and, in some sense, Barnard and Trojan. 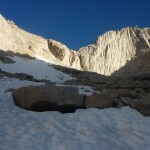 Completely agree with the insanity of restricting access to the peaks in the Wallace Lake drainage with the Whitney Quota, and the alternative entry points are all bushwhacks, or very difficult terrain. The FS really needs to rethink their quota policy. It ought to be by drainage, rather than Trailhead. We’ll be running into this same issue in a couple of weeks as we head over Suicide to Barnard, Trojan, Versteeg, Tyndall and Willy over 3 days. 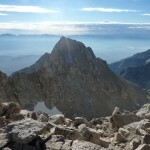 If the same elevation change holds for Barnard, then it’s CA’s newest 14er. If not, I would be glad to winch a suitable summit block in place to give it the extra couple of feet. As for quotas, the Whitney zone is really a special case because of two things people like to say they’ve done: Whitney and the JMT. It will never happen, but I would like to see a summit quota for Whitney (they could even put a ranger in the summit cabin checking people’s tickets…). 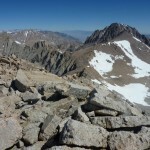 That would avoid the problem they tried to solve by expanding the zone a few years back — people using the Mountaineer’s Route to dodge the trail quota — while allowing people like me who aren’t climbing Whitney to get at the rest of the area. Then again, I’m developing a perverse fondness for Cleaver Col, so maybe it doesn’t matter. The ridge from Trojan (really, west down the ridge a bit) to Versteeg looked long and time-consuming, but probably doable. I know Burd ran into serious difficulties getting between Tyndall and Versteeg, though, and had to drop down to one side. Good luck! Thanks for the info on the traverse to Versteeg. We hope to make Lake Helen of Troy for camping on night one, so those of us who want Versteeg may drop packs and head out-and-back to it, based on what we see re: descending Versteeg to LHoT. If any of this looks too tough (based on fatigue), I may just head up the next day, as I’ve done Willy/Tyndall several times already. Permit by Peak works in many other countries. It is a good idea. RE: Mt. Barnard. When you have a chance track down a map from the 20’s. Barnard was listed at 14,003′. I don’t know when it was downgraded to 13,990′. I read somewhere that traffic to the area dropped significantly when it lost it’s 14’er status. It would be cool if it was added back to the list. RE: Suicide Col (Cleaver). Sometime when you’re not in a peak-baggin mood, try the “Doug’s Ranger Death March” loop around Mt. Whitney. 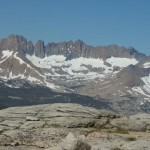 It goes from the Portal over the Col, down the Wallace Creek drainage, “down” the JMT, over Trial Crest back to the Portal. I did it in around 15 hours, with a side-trip up Mt. Morgenson to replace a missing ammo can, so I’m sure you could get it done in under 10. There are also a lot of alternate routes you can use to shorten this. 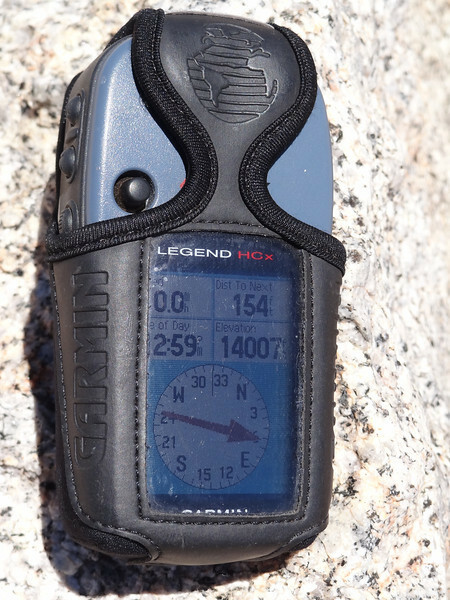 One we had fun with was to head up over Peak 12,nnn’ (can’t remember the elevation) to Mt. Young and then down into the Artic Lake drainage. If you head in to the Wallace Creek drainage you should take some time to explore the slots and cascades below the outlet of Wales Lake. It is an amazing area down there. This year, with alll of the snow, would probably be fantastic. Bummer. 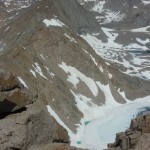 Are Crabtree Pass and the upper Meysan Lakes drainage next? They should really station a ranger in the summit hut to collect $20 bills.